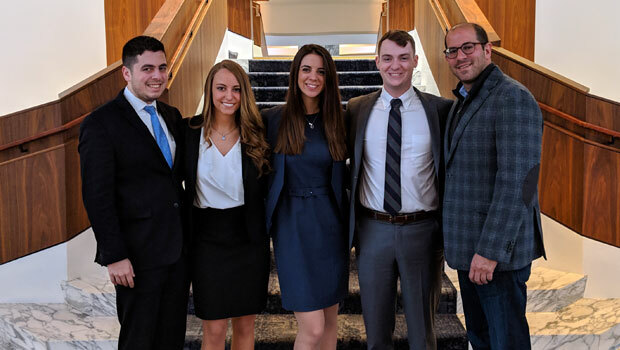 The Hofstra Law team of (L-R in the photo) Michael Grazio 2L, Cara Pascarella 2L, Gabriella Malfi 3L and Ryan Donahue 2L advanced to the semifinals in the eighth annual South Texas Mock Trial Challenge, hosted from March 28-31 by the South Texas College of Law Houston. The team was coached by Jared Rosenblatt ’03 (at right in the photo), faculty advisor to the Hofstra Trial Advocacy Association (HTAA). 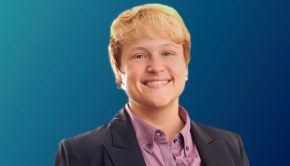 Rivka Shuter 2L also helped the team prepare for the tournament, in which 16 teams from across the United States competed. View more details about the South Texas Mock Trial Challenge on the South Texas College of Law Houston website.